For lovers of the Southwest here is a houseplant that requires no sunlight, no fertilizer and no watering. With “spines” made of eyelash yarn there’s never a scratch when handling. It’s always in bloom, regardless of the season! 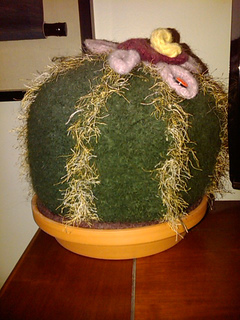 Make a Barrel Cactus with a “potting soil” base and pop it in a ceramic pot for a realistic look. Or, make it dirtless and free standing. Pattern is written for worsted weight yarn. 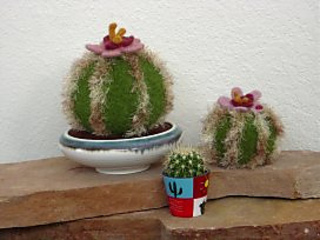 Sport weight and smaller needles (US 8 - 5.0 mm) can be substituted for a smaller cactus (4 1/2”).